The Vanderbilt Security Management System delivers a powerful, single source solution for integrating a facility’s access-control technologies, digital video, and alarm monitoring systems. Systems are scalable so that you can meet your security requirements today, and expand to meet your growing business needs tomorrow – all while satisfying your budget constraints. The Security Management System, or SMS, is perfect for large, multi-site or global organizations. 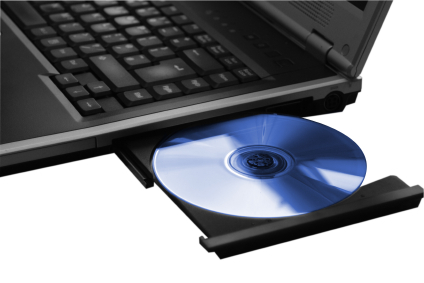 It supports an unlimited number of cardholders and readers and provides unparalleled flexibility. Our access control software allows you to manage alarms, photo ID badging, visitor management, elevator control, offline and online locks, advanced reporting and more – all from a single software platform! 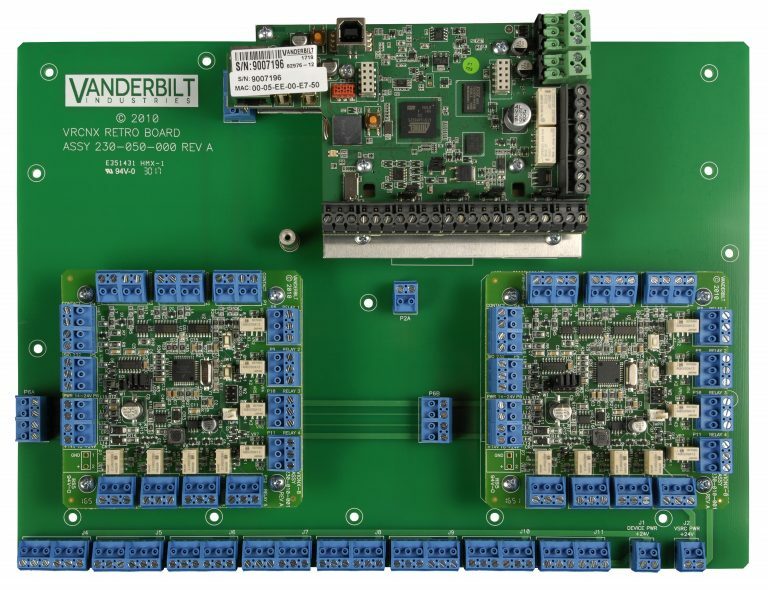 Vanderbilt also provides a full line of expandable access control hardware including reader controllers, reader interfaces, wireless readers, I/O modules, power supplies, custom enclosures, readers, and credentials. The Enterprise system is perfect for large, multi-site or global organizations. It supports an unlimited number of cardholders and readers and provides unparalleled flexibility by supporting both online and offline devices. The Enterprise system also enables an organization to manage facility administration from any location and provides real-time monitoring and audit trails. 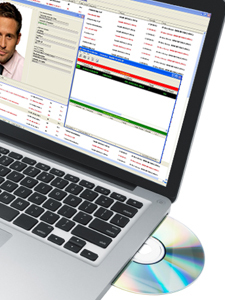 Our optional SMS Web application provides administrators with convenient remote access to critical system functions such as granting or denying cardholder access, facility lockdown and more. 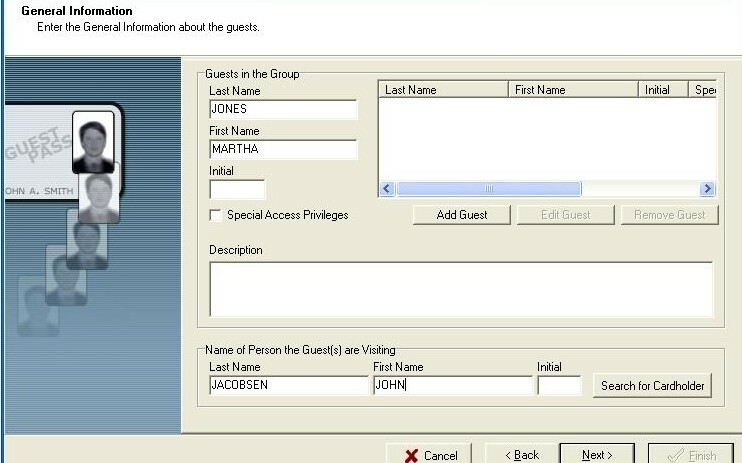 Vanderbilt VI Connect is a custom-configurable data management system that integrates SMS with third-party disparate databases, allowing for an automated business workflow between systems. A popular solution in higher education and enterprise organizations, VI Connect processes and manipulates data based on custom requirements and routes it to the appropriate third-party systems in their respective required formats. This eliminates the need for manual updates and cumbersome import/export processes typically required when managing multiple systems. Using VI Connect reduces the workload of system administrators and eliminates costly data entry errors. Additionally, VI Connect allows an institution to better leverage the investments made in third-party systems. 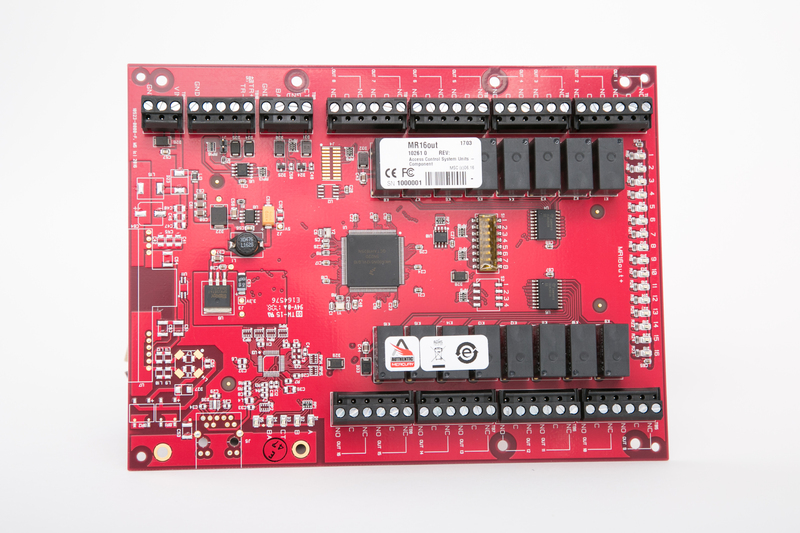 Networkable reader controller combines the capabilities of a controller and two reader interfaces into a single board. Supports four (4) contact inputs and two (2) Form-C relay outputs. 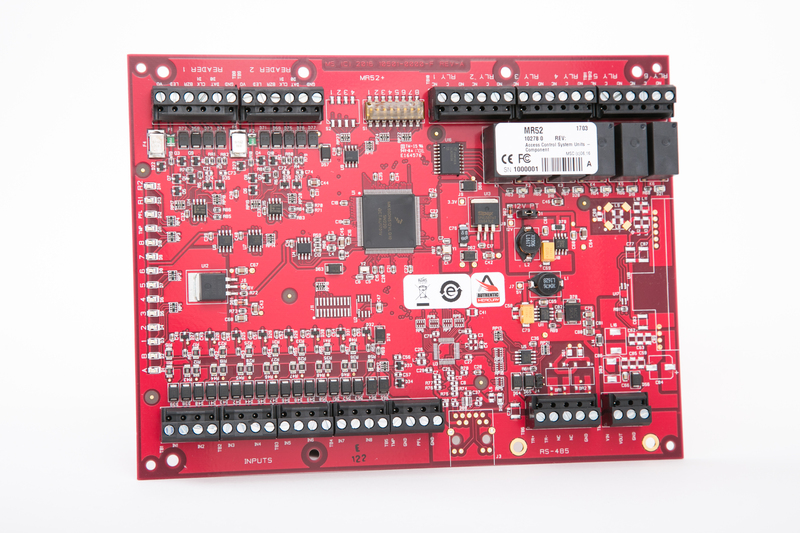 The VSRC-A communicates with SMS software via TCP/IP protocol and can be connected to a variety of read head technologies and electronic locking devices. 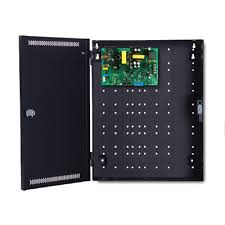 The VRCNX-A Reader Controller incorporates the controller and additional input/output connections to a single backplate for easy installation. Supports up to (16) reader interfaces or third-party devices. 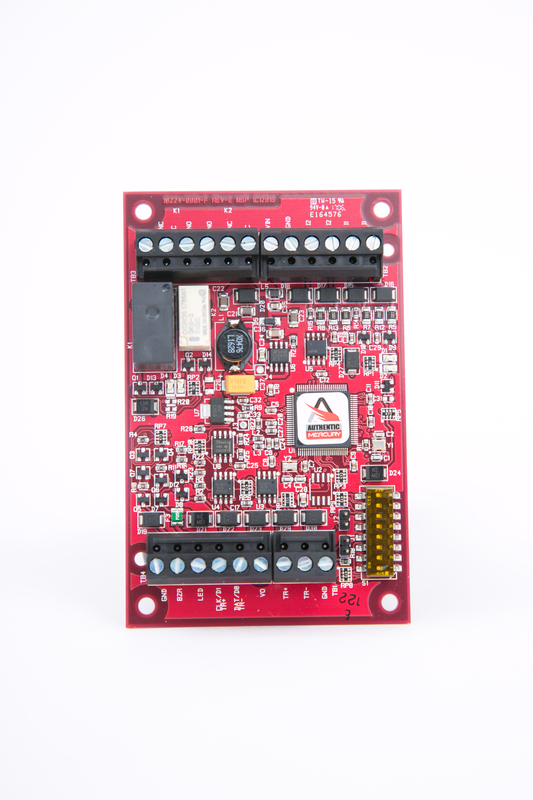 The Vanderbilt Reader Interface connects one read head to a Vanderbilt Reader Controller via RS-485 protocol. 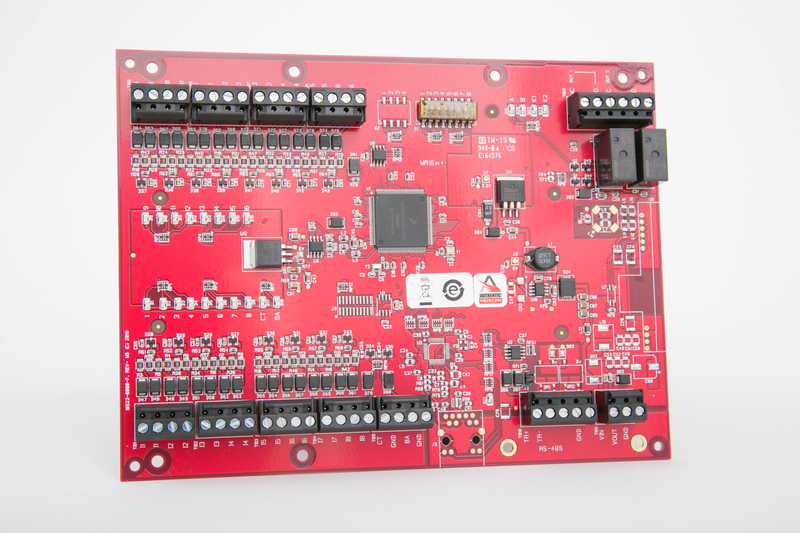 Includes (4) contact inputs and (2) Form C 1A relay outputs. Supports degraded mode for local decision making in the event of a communication failure. The VIONX-8 provides 8 contact inputs and 8 Single Pole/Double Throw relay outputs and communicates directly to Vanderbilt Reader Controllers. Supports universal triggers and alarm control. 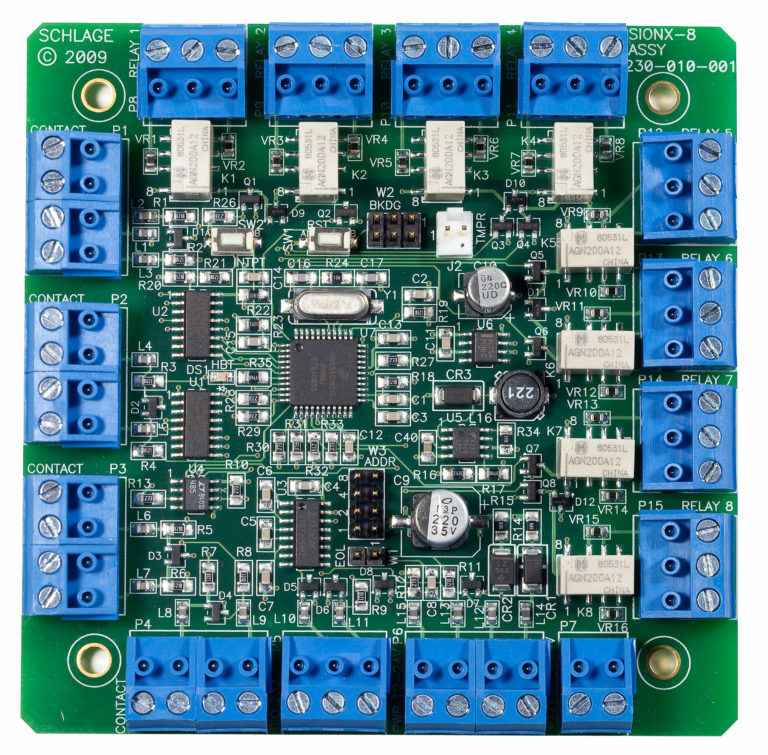 One or more VIONX-8 boards can be used to provide individual elevator floor control with each board capable of supporting up to 8 floors (1 contact per floor). The Vanderbilt Industries Universal Reader Interface is designed for sharing one reader on up to three different access control systems. The VURI can work with multiple reader technologies and is perfect for multi-tenant buildings with multiple access control systems utilizing turnstiles and elevators, for example. 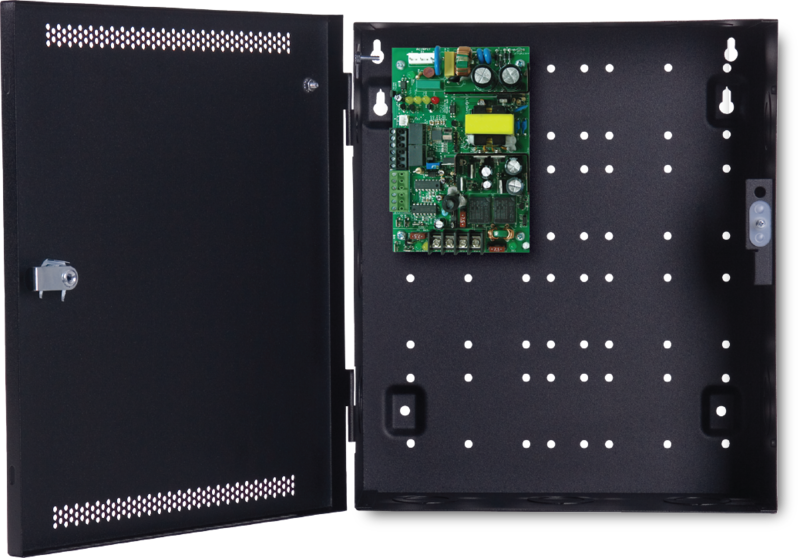 The VRI-1S3 Single Reader Interface offers a cost effective, modular approach to access control system design in all environments. Vanderbilt reader interfaces communicate directly to the reader controller and are capable of running in degraded mode, allowing for local decision-making if necessary. The VRI-1S3 connects one read head to a Vanderbilt VRCNX-A or VSRC-A Reader Controller. The VRI-2S3 Dual Reader Interface offers a cost effective, modular approach to access control system design in all environments. Vanderbilt Industries Dual Reader Interfaces communicate directly with the Vanderbilt VRCNX-A and VSRC-A Reader Controllers. 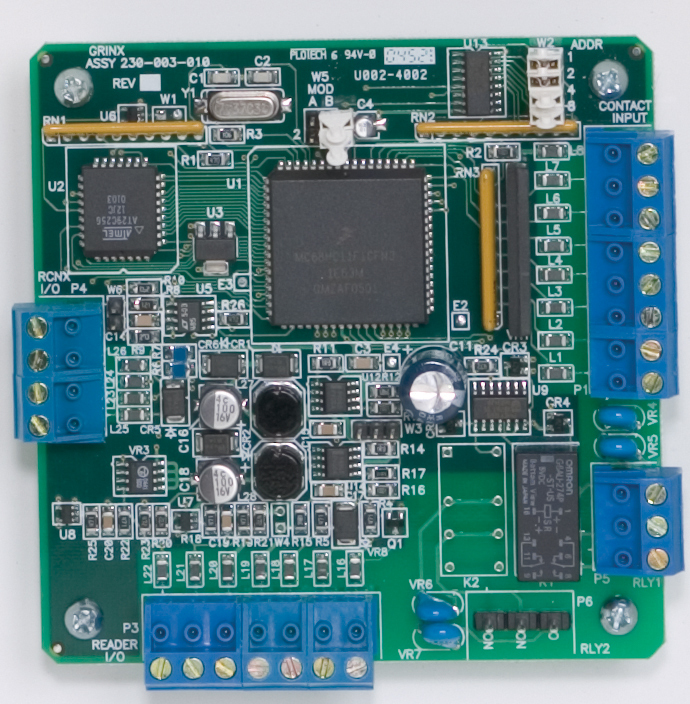 Vanderbilt Reader Interfaces are capable of running in degraded mode, allowing for local decision making if communication fails between the Reader Interface and the Reader Controller. The Vanderbilt VI-16INS3 16 Input Monitor Module is capable of supporting 16 general purpose inputs which can be individually set for normally-open or normally-closed operations and can be declared supervised or non-supervised. The VI-16INS3 communicates directly to Vanderbilt VRCNX-A Reader Controller. 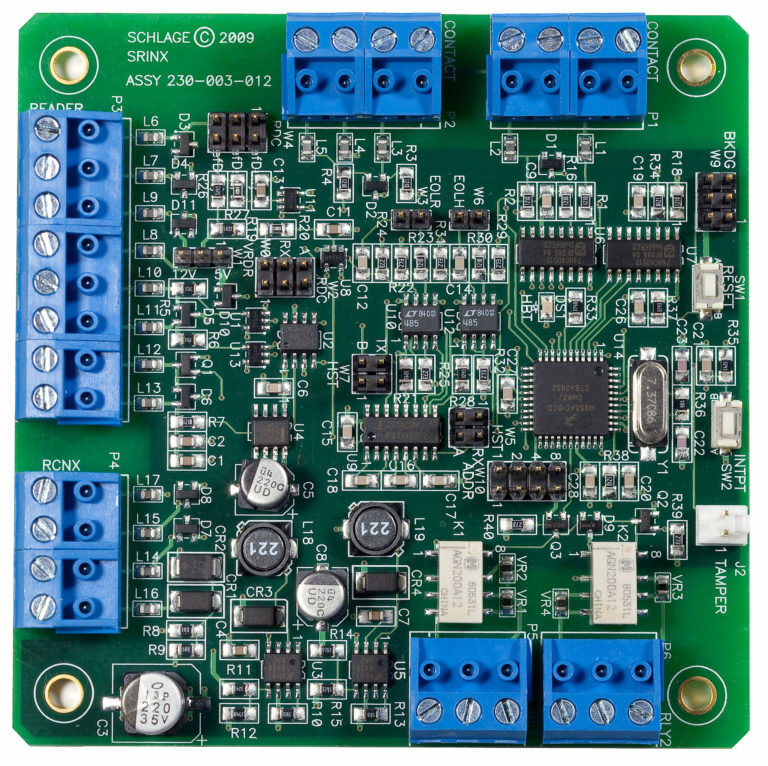 The VI-16OS3 16 Relay Output Module supports 16 general purpose outputs as Form C relay contacts which can be individually configured for timing and fail-safe or fail secure modes. Relay operation may be initiated by direct operator commands, time schedules, or event-based procedures. 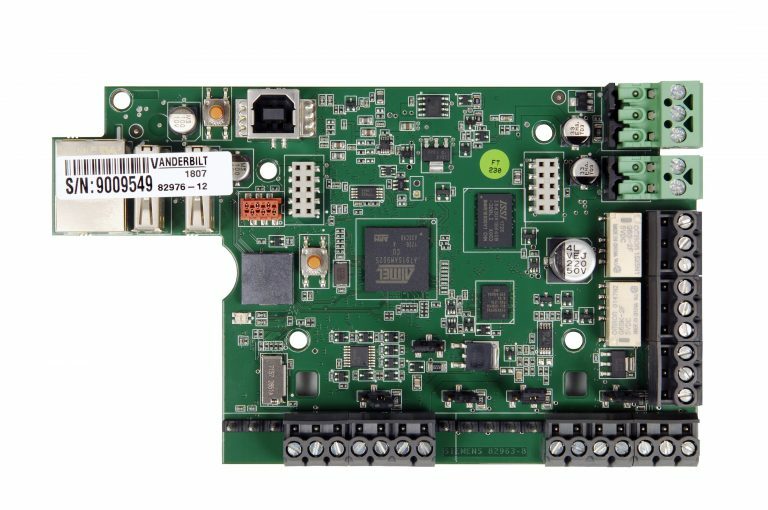 The VI-16OS3 communicates directly to the VRCNX-A Reader Controller board. Designed specifically for use with SMS, this 3 Amp dual voltage power supply includes battery charger and power supervision. On-board visual indicators allow for immediate installer feedback. Independent form C relay contacts are provided to report AC and system fault conditions to remote or auxiliary equipment. 3 Amps at 24VDC or 6 Amps at 12VDC selectable output. Power supplies come with two (2) 12VDC 7AH back up batteries. 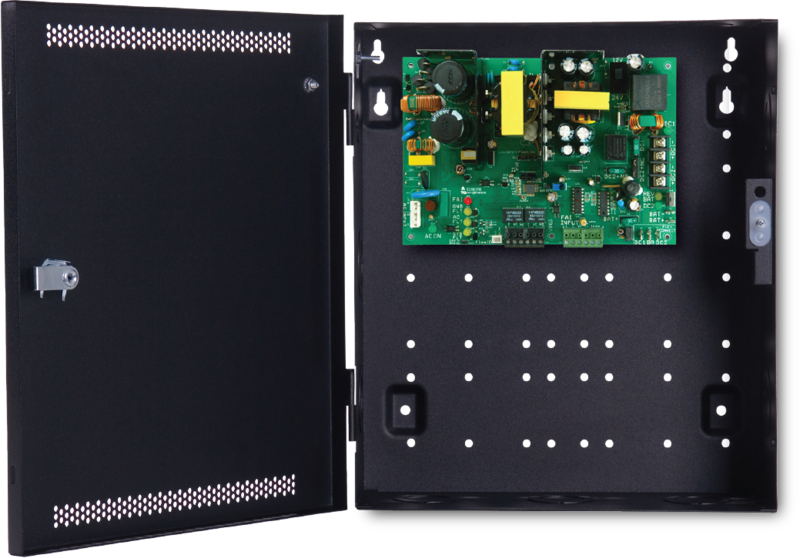 Our 6 Amp dual voltage power supply is part of our SMS product line and allows for flexibility in powering reader and lock hardware devices with SMS. Designed for excellent performance with readers, Vanderbilt power supplies are efficient, high performance switching power supplies with battery charger and power supervision. 6 Amps at 24VDC or 12 Amps at 12VDC selectable output. The SMS adjustable dual voltage power supply affords the utmost in flexibility when it comes to system configuration. This power supply supports 10 Amps at 24VDC or 20 Amps at 12VDC. All Vanderbilt power supplies are efficient high performance switching power supplies with battery charger and power supervision. Let Vanderbilt provide you with the tools for the Photo ID capture process. 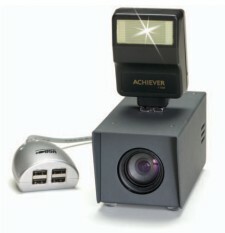 Our live camera can be used in for capturing photos using our SMS badging application. If your needs include remote photo capture, we offer a digital cameras for taking pictures and importing them into your SMS system when convenient. Use our electronic signature pad to capture employee signatures either for display on badges or just to keep on record in the cardholder database. And, finally, to really make the badging process easy, use our SMS enrollment reader to facilitate enrollment of online or offline credentials into the system. This single enrollment unit supports proximity, smart, iButton and magnetic stripe technologies. Our SMS custom enclosures are perfect for large installations – they come pre-wired and pre-tested with clearly marked components, snap on connectors, and labeled landing connectors for field wiring. Allowing for consistent installations, our Vanderbilt enclosures make service and maintenance easy. We offer a range of printers to meet your badge production demands. 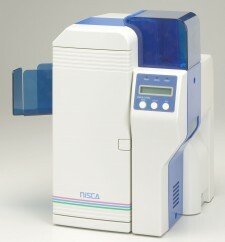 Customers with small to mid-size facilites may choose our simple, single-sided badge printer, while those with a large employee base may opt for a printer that can handle higher throughput and faster printing speeds. Vanderbilt Industries is your resource for single or dual sided printers, encoders and laminators.